I haven't forgotten about Squeaky, the Record Cleaning Robot... hope you haven't either. Since I have about 500 records give or take 100, I have plenty of records I can use to practice manual cleaning. There's no worrying that I'll be done cleaning my collection anytime soon. Now that I am getting the right technique figured out, I can start to design the robot. I figure the best approach is to build the machine to operate manually and add on the automatic controls a little at a time. 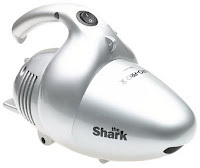 I'm using a small handheld vacuum similar to the one pictured. It comes with an extension hose and various attachments, one of which is wide enough to cover all the LP tracks. I wrap a microfiber towel around it to prevent scratching the LP surface. When it comes time to build the real thing, I'll create my own nozzle attachment and mount it on a moveable arm that will eventually be actuated by servos. To apply cleaning fluid I am using a small discwasher squirt bottle. This will be replaced by a sprayer from a garden drip system, powered by a spare 12V car window washing fluid pump I have on hand (means I need to build another DC power supply). I'll mount the sprayer on another arm that is servo controlled. Or maybe I will try to mount it to the same arm as the vacuum fitting. Not sure yet. Before vacuuming and after applying fluid, I lightly hold a paint edger pad against the wet record to "scrub" and will do something similar with Squeaky, mounting an edger on the sprayer arm. At least that is the plan so far. I'm sorry but I really get creeped out by Nexi, below. Which is interesting, because I wonder what it takes for a robot to socially interact with, and be accepted by, people? And what is it about Nexi that creeps me out? Meanwhile here's a much simpler study in human / robot interaction. Something this simple draws empathy and aid from New Yorkers. The little simple "robots" have a flag asking for help in being pointed in the right direction to their destination. Passers by consistently lended a hand to the little 10" machines. Of course you've probably seen the Japanese, humanoid, female robots. One that was slated to work as a model on the catwalk. And another from back in 2006 at a robotics festival (I suppose that one is more along the lines of intelligent animatronics). These might be a little less freaky to me than the MIT robot above. But I suspect the closer they look to humans the harder it would be to anthropomorphize them.